Surrounded by the rugged beauty of the Scottish countryside, The Green Hotel, Golf & Leisure Resort is a remarkable hidden gem, perfect for those seeking a golf break in Scotland. The Green Hotel Resort is all-encompassing, featuring five restaurants, an extensive spa, a live music venue, a curling rink, and access to the fishing waters of Loch Leven. Of course, the main attractions at The Green Hotel’s breathtaking 5000-acre estate are the two championship golf courses. Both the Bruce and Montgomery courses at Kinross Golf Club are epic parkland layouts, showcasing the eternal beauty of the Perthshire hills. 1 in 12 goes free between 1st March 2019 and 31st October 2019! The Montgomery Course is fair for the weekend or occasional golfer yet the course provides a test for the more accomplished and experienced player. The Montgomery's statistics (6,508 yards, par 72, SSS 72) are not jaw-dropping yet why have so few good golfers broken 80 on this course? The addition of new white tees plus 19 new bunkers and a pond made life a little more difficult but perhaps the answer to the question can be found at the very first hole, a slightly downhill short hole where most will consider the 161 yards from the white tees to be less than daunting. Yet any shot that misses the difficult green will, more often than not, lead to a bogey. And so it goes on The Montgomery: many holes may seem straightforward on the scorecard yet the subtleties of the design combine with penal bunkering and challenging green complexes to create a course that makes consistent scoring difficult. A stern test to relish! If The Montgomery is the sensible, polite, and determined sister destined for a life of professionalism and hard work, then The Bruce is the sister who is less predictable and more likely to stray off the beaten path. Proof comes in the par-39 outward nine where you'll find four par-5s in the space of six holes. Yes, the challenge is a little gentler on The Bruce. Weekend golfers often find The Bruce is more to their liking but the better golfer who sees four early par-5s and thinks, "that's four birdie holes" often finds their card in shreds embarrassingly early in the round. Yet sometimes, even a modest golfer finds a way to take advantage of the scoring opportunities that The Bruce presents. 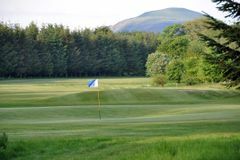 Golfing at Kinross fits in perfectly with the tranquil, classically traditional atmosphere of a stay at The Green Hotel. The Green Hotel is a more traditional historic property which dates back to the eighteen century as a coaching inn and is just across the road from the golf courses. There are two super dining options to choose from. At The Green Hotel guests can enjoy a meal in the elegant Basil's Grill restaurant or in Jock's Bar Coaching Inn, and enjoy a drink in the pretty Courtyard Bar. The hotel was lovely, large rooms, clean but require a little TLC to upgrade them. Staff were excellent and food very good. Only played 10 holes as the weather was unsuitable.